When configuring actions in Zabbix for example for problem alerts, there is a built-in method for sending email notifications. 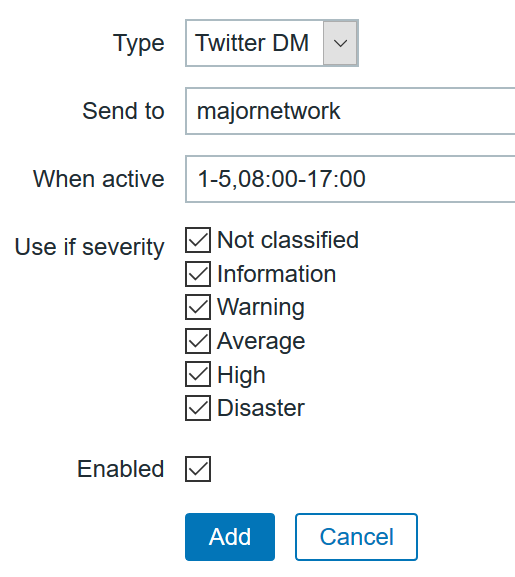 Here are the instructions for sending alerts as Twitter direct messages. These instructions are based on a Debian 8 Jessie installation where Zabbix has been installed from the packages in the Zabbix repository. After this operation, 9,539 kB of additional disk space will be used. Selecting previously unselected package twidge. use with Twitter (or a similar service). This will be quick and easy! OK, next I need you to authorize Twidge to access your account. key in your browser window. Copy and paste it here. Twidge has now been configured for you and is ready to use. /usr/bin/twidge -c /usr/lib/zabbix/alertscripts/twidgerc dmsend "$TO" "$SUBJECT"
markku@Zabbix:/usr/lib/zabbix/alertscripts$ sudo ./tweetdm yourhandle "This is a test message"
If your message does not get through, please check that the configuration file is in place and that you actually follow the sender account that you created in the beginning. Now that you have the sending script prepared, you need to configure Zabbix to actually make it possible to use the mechanism. Next, configure your users with Twitter handles. When returning to the Media list page remember to use the Update button to actually save the user configuration changes. 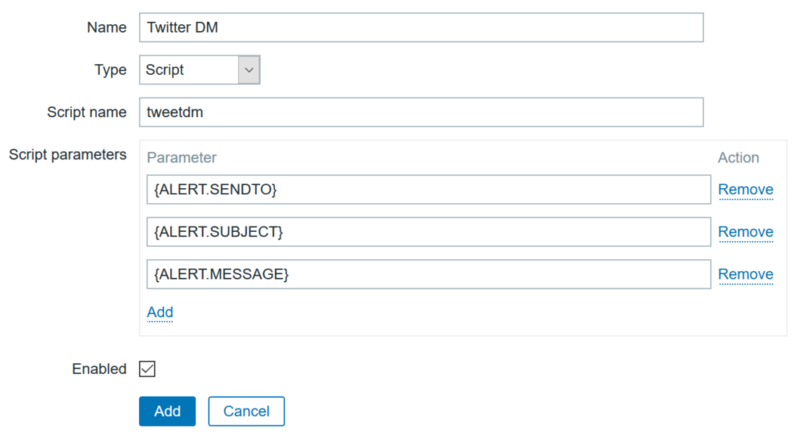 Now you have the user(s) setup to receive DMs, but you still need to configure your actions to use DMs. Please note to use the “Add” links and “Update” buttons appropriately to actually save the changes that you have done in the configuration pages! Afterwards also go through the configurations again just to be sure. It seems to be the usual problem for a Zabbix beginner to miss clicking on the crucial Add links to get things saved. This means that in this particular action it will send an email and a Twitter DM, separately.